One of the challenges that progressives frequently face is that they like to be sticklers for facts, at least wherever possible. And since a basic tenet of progressive beliefs is that many societal problems can best be solved through pro-active engagement by the federal government, it becomes frustrating when then federal government does not acquit itself well. In our local community of St. Louis, Missouri, there seem to be three public works projects with considerable federal funding that seem to involve potentially unwise expenditures of those federal bucks. These local projects are often where citizens get to meet the federal government “up close and personal,” so when they are lemons, it can definitely color the confidence that citizens have in the feds to address large-scale problems. Most public works programs start off in the “aggravation lane” because they often cause disruption and inconvenience well before the first presumed benefit of the work ever appears. 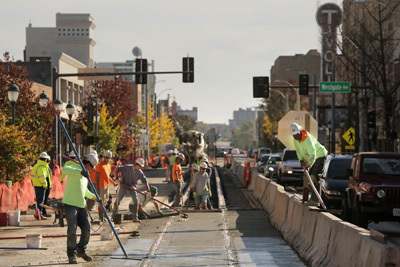 A $51 million project (behind schedule) in St. Louis is the Loop Trolley running 2.2 miles from the University City Loop near Washington University to the Missouri History Museum. With a transportation project, a good initial question is “does anyone travel from Point ‘A’ to Point ‘B?’ In the case of the U. City trolley, the answer is that people do indeed convene at either end of the route, but rarely do they traverse the exact route. There will be intermediate stops along the route, but none will be high capacity venues. The trolley is the brainchild of University City entrepreneur Joe Edwards who has committed most of his life to make the area in which he grew up into both a livable and exciting place to live. A trolley is quaint, clever, and unique. Running along a major corridor, it can be very helpful to a region’s transportation needs, particularly if it has an exclusive right-of-way. But with the U. City trolley, it is designed to go down existing roadway, streets that coincidentally used to be home to streetcars. The tracks were pulled up fifty years ago because the streetcars and automobiles could not conveniently co-exist. At this point, there is no reason to believe that the new trolley will have some new magical feature that will allow automobiles to comfortably move, especially since this route has always been nothing but stop and go. Over the course of the two years of construction, once vital businesses have bitten the dust because construction made it difficult for consumers to get to entry points. The bottom line seems to be that this idea may have been considered an asset to gentrification of an area that was struggling to rebound, but collateral damage has already been significant and it’s unlikely that when completed it will come close to meeting its intended goal. This will not look good for either the local governments or the federal government. A second project is revamping downtown’s Kiener Plaza. The $19 million project is designed to “better connect to downtown’s urban fabric, be flexible for events year-round, and offer new urban park amenities.” The problem is that the current plaza does exactly that. 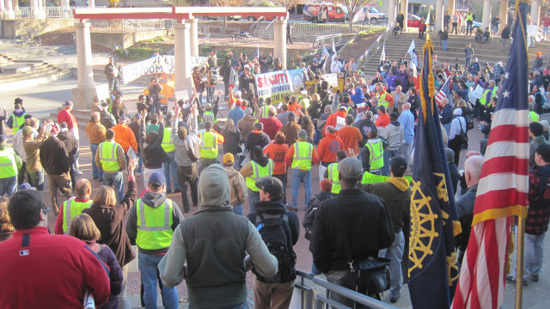 The photos below show how it was effectively used in 2011 in the Occupy St. Louis movement. It was a great town hall place with an amphitheater where citizens could gather to take on issues of the day. It might have been mistaken for downtown Athens 2,500 years ago. It had a vibrancy that is lacking in most of St. Louis. But now it is demolished. It is being replaced by a “water garden,” which indeed will be nice for families, particularly children. The problem is that such a park already exists only a block away. Because the new plaza will have streaming water, it will not be a venue where citizens can gather to engage in public dialogue. Why is this $19 million being spent? There are no clear answers. What seems most likely is that local officials want to extinguish public protest downtown and they are being aided in their efforts by federal dollars. Finally, there is the surprising news that within a few weeks, work will begin on eliminating the Forest Park Parkway underground viaduct beneath Kingshighway and replacing it with a new “at-grade” crossing. Proponents say that it will improve traffic flow and make the intersection more pedestrian friendly. But how can traffic at an intersection move more smoothly than it does when one street goes under and the other street goes over? And how will pedestrians benefit from a thoroughfare through a park? There must be some answer, and it probably has something to do with the main property owners in the area, Barnes-Jewish Hospitals and Washington University Medical Schools. Their reasoning may be even sound, although not yet publicly disclosed. But the project is going to take a year of work and inconvenience. It doesn’t look good for either the city or the federal government. I recently completed a two-week trip around America on Amtrak. All of the federal employees were extremely friendly and helpful. That speaks well for the federal government. But questionable local decisions with federal complicity do not engender faith in the federal government. I think that it would behoove progressives to work to ensure that federal monies are neither wasted at the local level nor become an enabling factor for the kind of frustration that construction projects often bring. Call these projects what you will, but they’re all pork. Some pork is better than others and we need to be more discerning. 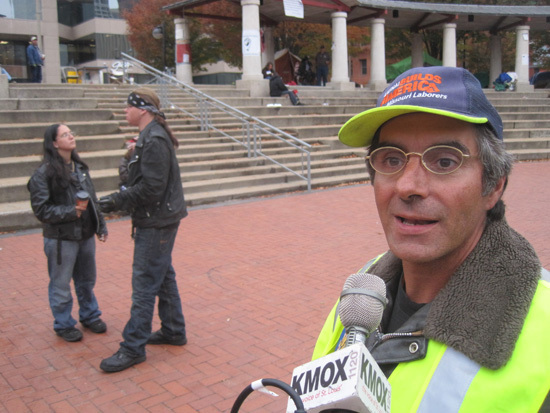 Previous Post:A MO Democratic candidate calls for a Balanced Budget amendment. Wait, what? Next Post:Amman, Yemen, Istanbul, Dhaka, Baghdad, Medina: Where is the outrage?